Jute is found in nature. It’s an inexpensive, biodegradable fiber product. While starting jute bag making business you will to pay attention to the location. This is because easy availability of raw material is an important factor. This business is ideal for West Bengal, as well as, for north east part of India including Tripura, Nepal, Assam, Manipur, Sikkim and Arunachal Pradesh. Due to its eco-friendly character, the demand for jute yarn, jute fabrics, and other jute items are increasing rapidly. New technologies have evolved for using of jute in bulk as a raw material in the production of high value added and price competitive final products. Jute fabrics are known for its strength, durability, lightness, colourfastness & attractiveness. It’s less costly than most fabrics made from other fibers. These are anti-static, UV protective, carbon dioxide neutral and decomposition happens naturally. Jute fabrics are excellent raw materials for manufacturing jute bags. A jute bag is known for its versatility. Jute sacking bags are mainly used for the purpose of packing cement, sands, agro products, sugar, as well as, other bulky items. These bags are extremely ideal for transporting bulk food items like onions, potatoes, flour rice, fertilizers, etc. Colourful decorative jute shopping bag has very good demand & can be used for promotional purposes. Jute bags can be utilised as a primary bag for the purpose of carrying textbooks, folders, lunch, mails, etc. It is also being widely used as an office bag for those who care for the environment. Jute bags come in various different designs. Different types of a small ladies purse made of jute is also becoming very popular. With population increase, the scope of trade and industry is also rapidly increasing. There is no doubt about the fact that bags are an essential commodity for a human. With increasing awareness about the environment, pollution has increased the demand for jute bag exponentially. 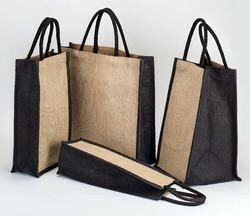 Laminated and non-laminated jute fabrics are the main raw materials required for jute bag manufacturing. Other required raw materials are dye stuff, printing gum, chemicals and auxiliaries, PVC buckle and bamboo sticks, sewing thread, hook, runner, chain, lining cloth, eyelet, and handle packing materials, label etc. You will need to install industrial sewing machine. Select the right machinery for your business according to the required stitching pattern and production output. For jute bag manufacturing purpose, you might need different quality of side sealing machine, lockstitch machines, woven sack bag cutting machines. The jute bag manufacturing process is not that complicated. After procuring the raw materials, you will have to make the proper designs and patterns. Just cut the jute cloth to make bags as per drawing, design & size. After cutting, place the jute cloth on the table and print it. Then stitch the cut pieces with the sewing machine. During the process of making the jute bags, you will need to fix the other consumables such as lining, buckles, chains, runner, handles of clothes, bamboo, and canes. After completion of these works, pack the bags and dispatch to market for sale.